Welcome to Honeymeng.com - your reliable custom cake toppers and wedding cake toppers supplier! Honeymeng— A professional custom cake toppers / personalized cake toppers provider, whose head office is located at HONGKONG, and own a creative studio with moren than 40 designer member. Every order is handcrafted by one of our sculptor from start to finish. Our sculptors try their best to make every part and deatils of your cake topper perfectly. every cake topper is unique, and just 100% handmade for you. We supply superior quality custom cake toppers. All of our custom cake toppers are made from the finest ( FIMO ) polymer clay made in Germany , and are carefully inspected by a responsible QA team before packaging. All of our custom cake toppers are water-proof, anti-fire, anti-bacterial, no peculiar smell and durable at the same time. Our custom cake toppers 100% handMade by skilled craftsman- from head to toe. Every of our Craftsman have over 5 years experience at this area, they are confident to build a Satisfying gift for you. We sale directly from our factory, and cut out the middleman, so that we can offer 30-50% cheaper price than like products which you can find online! 4, International Quick Shipping ! 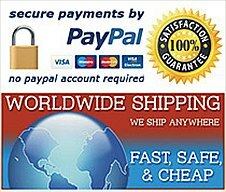 We ship Australia wide and internationl, you can choose "ships within 15 days", "ships within 10 days". Want to get it ASAP ? no problem, we can complete and ship within 5 days! We offer flexible payment options, including PayPal,Western Union, and bank transfer. All the products cover a 12-month warranty. We have a responsible customer service team to provide helpful after-sale services. If the custom cake toppers meet with any quality problems or accidental damage,you can sent back to us and get free restoration service within 12 months,but you should responsible for the round delivery fee! Usually we use DHL, Fedex: It is really fast and you can track online anytime. Normally, it takes 2-4 working days to worldwide main cities . You can choose appropriate sculpturing and shipping methods to meet your need, the cost may different according to different priority. F, FREE SHIPPING- When order more than $500, Ships within 3-4 weeks, Proofs. For example, if you choose "ships within 15 days" on 1 May, then we will arrange to complete your order and send out by DHL before 16 May. and usually, you may expect to get it 2-4 days later. All merchandise is carefully packaged for shipment, and damange case seldom happen. If you get damaged dolls, please take photos and contact us soon. (Digital photos of damaged product is necessary for our damage claims. Proofs must be sent to us within 24 hours after you get it). Once confirmed, We will remade new cake toppers for you to replace shortly. 100% satisfaction guarantee. You may cancel your order and get full refund before we begin to handmade your order and show you the first proofs. Once we begin your order, only 50% refund if you want to cancel your order - please understand that, it is a special Merchandise that we custom made for you.